Over the past two decades, the Arabian oil-rich Gulf countries have faced enormous social, political, economic, cultural, religious, ideological and epistemological upheaval. 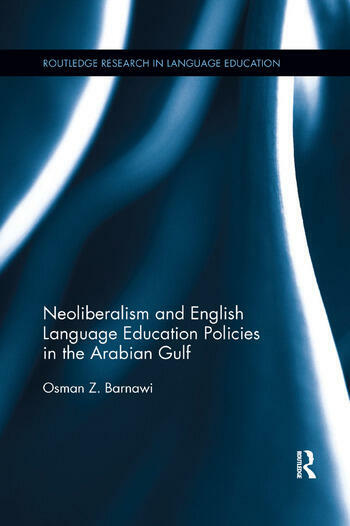 Through detailed, critical comparative investigation,　Neoliberalism and English Language Education Policies in the Arabian Gulf　examines the impact of such disruption on education policies in a political and economic union, consisting of six countries: Saudi Arabia, the United Arab Emirates, Oman, Qatar, Bahrain and Kuwait. Using data collected from a wide range of sources, this thought-provoking book documents the inner workings of neoliberalism across a strategic geographical area of the Islamic world. The book teases apart the complex issues surrounding the ways in which access to English has been envisioned, contested, and protected from being challenged among different players within and between the Gulf countries. Osman Z. Barnawi explores the intensifying ideological debates between Islamic culture and Western neoliberal values, and questions whether Islamic values and traditions have been successfully harmonised with neoliberal capitalist development strategies for nation building in the Arabian Gulf region. Neoliberalism and English Language Education Policies in the Arabian Gulf　will be of interest to academics, researchers and postgraduates working in the fields of language education and, more specifically, TESOL, applied linguistics, education policy, and teacher education. Dr Osman Z. Barnawi is Associate Professor of Composition and TESOL. He is the former Managing Director of Yanbu English Language Institute at the Royal Commission Colleges and Institutes, Yanbu, Saudi Arabia. He is now the Managing Director of Yanbu Technical Institute at the Royal Commission Colleges and Institutes.